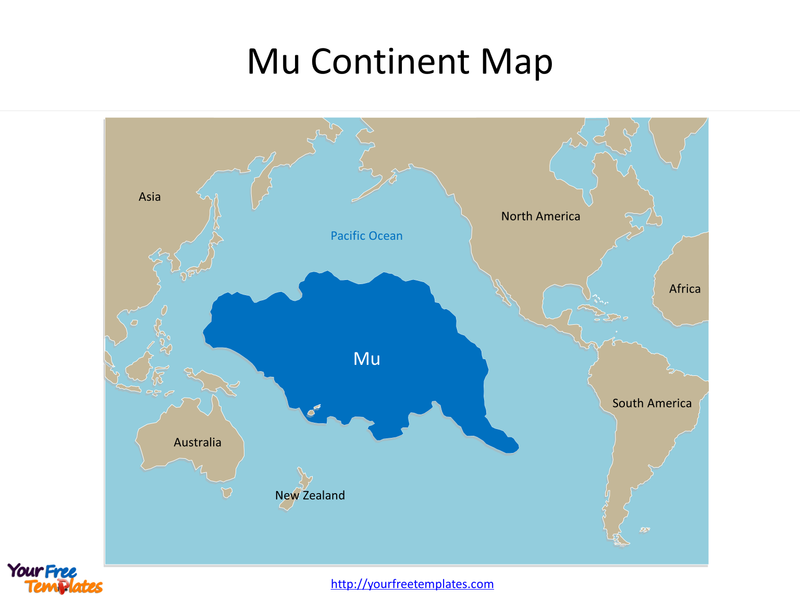 The Mu Continent Map Template in PowerPoint format includes one slide, that is, the Mu Continent outline map. You can check our continent series map like World, Asia, Europe, Africa, North America, South America, Oceania and Antarctica. Also our Ocean maps like Pacific Ocean, Indian Ocean and Atlantic Ocean. Mu is the name of a suggested lost continent. Firstly 19th-century traveler and writer Augustus Le Plongeon proposed the concept and name. He claimed that several ancient civilizations, such as those of Egypt and Mesoamerica, were created by refugees from Mu—which he located in the Atlantic Ocean. Secondly James Churchward popularized and expanded this concept. He asserted that Mu was once located in the Pacific. You can find surrounding continents in our Mu Continent map PPT template. Currently scientists have dismissed the concept of Mu as physically impossible. They are arguing that a continent can neither sink nor be destroyed in the short period of time required by this premise. What is more, every individual surrounding continent such as Asia, North America, South America, Oceania including Australia and New Zealand are editable shapes. The labels and shapes are different layers by group. In a word, you can change the texts, colors, sizes, highlight some map shapes, and add your charts. At the same time you can also refer to the fully labeled Map of Mu Continent in Wikipedia. Believe it or not, analysts from marketing research companies, consultants from professional firms think highly of our website yourfreetemplates.com. Most important of all, our maps can help to reduce their workload and create good-looking maps.